We live in a time of rapidly advancing technology everywhere, especially when it comes to digital cameras. Long gone are the days of that infrequent film camera purchase, where the type of film you used determined so much. Not so in our digital world. The wear it out, get it repaired cameras seem to be gone, or so it would seem. Now you see new camera models from all leading camera manufacturers hitting the market faster than ever. Keeping digital cameras and passing them down to family members, or using them until they wear out by most consumers is a rare occurrence. Having a look at eBay only confirms this, with many listings for camera bodies touting ‘as new’ condition with limited usage. All with many more amazing features that we can’t seem to live without. The days of lusting for, and saving up for any particular improved model for any reasonable amount of time is now null and void it would seem. Camera manufacturers are spitting new and improved high-end models at an ever-increasing rate, each company trying to garner our attention. It’s all about built-in obsolescence. From my experience of being involved in digital photography since the jump from film years back, 6 to 7 years seems to be the time span I feel is sufficient where technology takes big steps in sensor improvement. That’s where it counts. Beyond that, it’s just bells and whistles such as programmed in image stacking, improved focus and so on. This time frame seems to be when a new camera body purchase will show a noticeable improvement in quality if you’re actually printing and enlarging your images beyond 16×20 for the most part. Most camera bodies produced within the last 10 years have more resolution than anyone needs unless you’re frequently producing billboard-sized photographs. What I’m saying is, spending fewer dollars on a new camera body and spending more time shooting and learning with the camera you have already, will bring your photographic visions to a higher level quicker than the latest camera model will. Also remember, if you’re shopping in the strata of flagship models or pro bodied cameras, many are built for professional purposes and durability. They can take an extreme beating and are seldom replaced when new models come out. They are repaired and hit the streets time and time again and have more than enough resolution for their intended usage beyond 7 years. 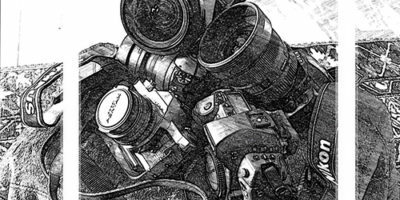 After selling a multitude of prints and murals over the years, I have never had any of my clients ask me what camera I used, or for that matter how many megapixels my camera was that any particular photograph was taken with. My advice to anyone hoping to improve their photography is to hold off on that new camera purchase unless the one you own already is well past this 6 to 7-year technology shift. Spend your money on a top quality lens instead and spend more time shooting and developing solid compositional and storytelling skills. This is where it counts. While a new camera is fun, it’s a tool and will only take you as far as your ability to master your photographic skills and no further. Remember, the story is king in the world of photography. You can tell the same compelling story with last year’s camera model as well as this year’s latest camera model. Additionally, if your skills have reached a level beyond what your present prosumer camera can offer you technically, then by all means upgrade. But in my experience in teaching photography workshops, most people seldom scratch the surface of their present camera’s full potential. I hope to see you on one of our private or group workshops with Jansen Photo Expeditions in the near future.